Sherwood Wolf Hunt continue to go from strength to strength on and off the grass. 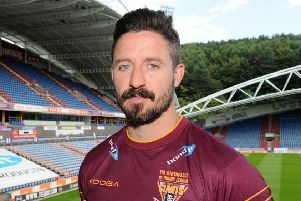 The rugby league club, based in Mansfield Woodhouse, have signed an international captain with more than a decade’s experience in the game. Yoakim Svensson joined the Wolf Hunt last week and has already impressed coaches and management with his understanding of the game and sheer strength. At the age of 30 the club believes Svensson arrives at a good time in his career to lead the Wolf Hunt’s charge and pass on that experience to others. Co-chairman Richard Tempest-Mitchell described Svensson’s attributes. Tempest-Mitchell said: “He’s Sweden’s captain and I’m really pleased to have him on board. He’s 6’3”, 19 stone in weight and has a very good understanding of rugby league. He’ll be a useful addition for us. He played a bit of ice hockey too. He’s a sportsman through and through. “He’s at the right age for us. He’s played the game at a good level now for ten or more years, most recently in the second tier out in Australia, so he’ll know the nuances of the game that we are trying to teach some of the others at the moment. “He arrived through Fabian Wikander, who used to be Sweden’s captain, they knew each other and Yoakim mentioned he quite fancied the chance to test himself out in England. They are both good additions for us. “We’ve made some links in Sweden and we’re looking to create more as well as strengthen those we already have when Sweden play Norway on July 15. We’ll go over there and promote our good name. We offer a chance to work and play. “Yoakim has got a job working in construction over here in England. He was building a giant dam over in Sweden before he arrived. He has all the attributes, he was carrying 80 pounds in weight on each arm yesterday. The Wolf Hunt’s first team have enjoyed a strong start to their 2016 season in the Midland Premier East, having won four of their six matches ahead of Saturday’s encounter at top of the table Leicester. “The first team were at Leicester on Saturday,” said Tempest-Mitchell. “They were top and we were second going into the game. We played them three weeks ago and probably didn’t do ourselves justice. We were a little dis-organised but it’s very much a learning season for us. And for Tempest-Mitchell and the volunteers at the club, the key word is ‘progress’. “We are in an area which historically has been very rugby union focused so it’s going to take time to build the club. There are some learning the basics of rugby and then the nuances of rugby league to rugby union,” he said. “The team is going up against players who have played the game since they were eight or nine years of age and by the time they are 18 and 19 are firing on all cylinders. They know when to run and when to kick, go fast and slow it down, where to stand. “The lads have to get to that place where it’s second nature to them and they don’t have to think before they act because that split second of hesitation is all it takes sometimes. That’s why we’ve introduced the junior section, so that in years to come it will be. And added: “We had a lot of lads turn up for the development game against Rutland recently who are on he edges of things so it was great experience for them to be involved. Most hadn’t trained and wanted to have a game. There were about five or six who have played to give the team some direction but the rest were on the edge. “It was a good test for us against another club in the midlands and we play them again next Saturday at our ground. I hope there will be another ten new players involved again. The second team games are attracting a lot of interest and we want to keep that going. For a club still very much in its infancy, it has made significant strides over the past two-and-a-half years and the co-chairman wanted to praise the work going on behind the scenes by a dedicated group of volunteers. “There is so much great work going on. Everyone has been fantastic and we’re really seeing the rewards. We started with just four and now we must have a team of about a dozen looking after different aspects of the club,” he said. “Adam Bates (co-chairman) is so well organised. Without that logistical input it would not work. He enjoys his role as the others do too. We’ve got to the stage where we are looking at merchandise. People are asking for shirts with the Wolf Hunt on. “The team works so well together there’s a great environment around the club and we’re ever growing. With the juniors and a second team we are building the club and more and more people are getting involved.